The US Yield Curve inverted as 3m Treasuries trade at a higher yield than 10y treasuries. This narrative began spreading throughout financial media last week. It may not sound relevant to the average investor but the gauge attracts attention among many finance professionals. They are aware that an inverted yield curve has been a reliable early indicator of economic recessions. Evidence-based research articles have been published on that subject since the 90s. The inversion did not come as a surprise to us. We took the contrarian view and argued for a nearby peak in 10y Treasury rates during Summer 2018. The prevailing view back then was that inflation is likely as the economy expands. Most market participants were rather guessing the amount and frequency of rate hikes in 2019. Things turned out very differently than the majority expected back then. Rates came down notably over the course of the last six months. 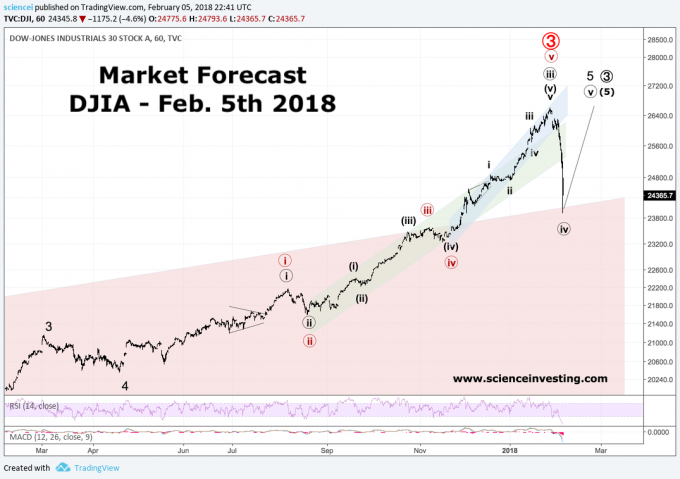 We observed in early February 2019 a corrective sideways pattern unfolding. It was a clear hint to us that “the US Treasury rates cycle, which unfolds since late 2018 is probably incomplete. There will be at least a few more months of falling rates in 10-year US Treasuries. The setup is tradable and suggests a positive outlook for holding US Treasuries.” 10y rates resolved to the downside during the past few weeks. The bond market is approaching the next interesting junction. 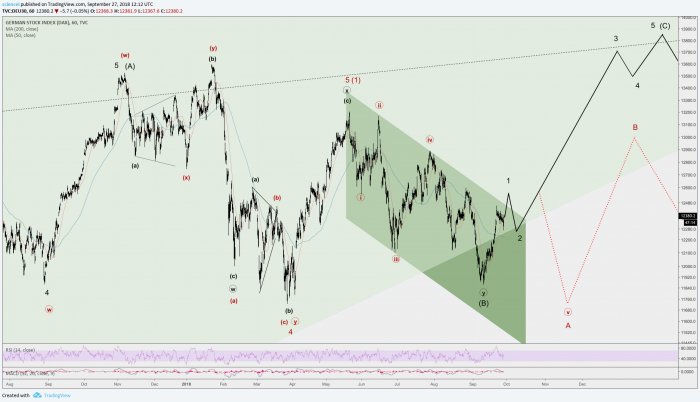 Therefore, it is reasonable to begin questioning at this stage: Are we close to a cyclical bottom? The exuberant sentiment that we witnessed during Autumn 2018 cooled down significantly. Long duration may be even getting a crowded trade at the time of this write-up. However, it is probably too early to call a cyclical turn right now. Extreme readings have not been witnessed yet. 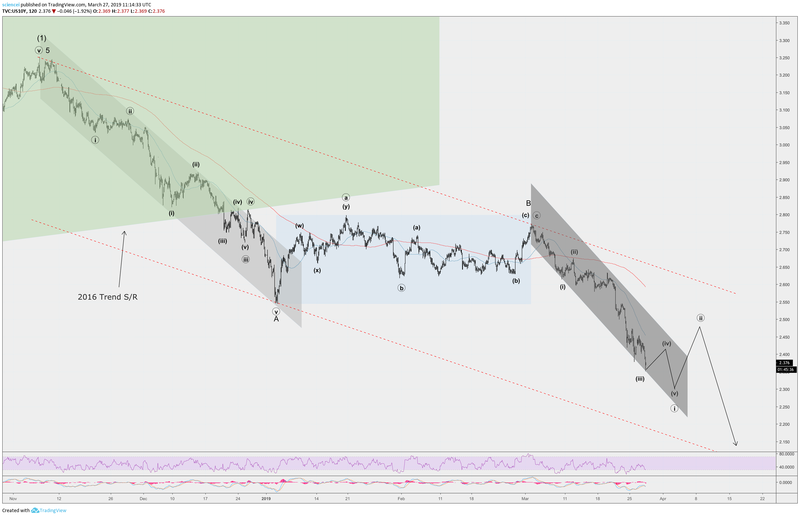 There is probably ample of room for rates to move until we get to a capitulation situation. 10y Treasury rates are likely to continue their journey to the downside. The darker grey trend channel is probably the start of a larger trend to the downside. We’ll stick to this outlook as long as the red dotted trend support (upper line) does not get convincingly crossed to the upside. All in all, long duration is probably a riskier trade today than it was a coupe of months ago. However, behavioral and technical data point to more downside during this rate cycle.